Over the last three decades China slowly transformed its strictly centrally planned economy into a more market oriented economy, where technology is to play an important role. As a result the role of science and technology was newly defined to let technology modernization serve China’s economic growth. This also led to strong links between new industries in China and the academic community. The government still plays an important role in the planning of R&D and is likely to do so in the future. Of late China has become very active in bionano, biosensing, high-throughput sequencing and medical diagnostics. The driving force between this is in the first place the active support of the government, wanting to ensure a strong position of China in this field, not just in manufacturing, but especially in intellectual property and product ownership. A second driving force is the increase in healthcare demand and spending. The long-term focus of the Chinese government is to expand and upgrade country level hospitals, increase patient traffic and support local brands. Currently private hospitals provide around 9% of all national healthcare services in China, expected to rise to 20% by 2015. The better availability of the healthcare services will lead to more usage of these services and increase the market for medical diagnostic products. This will especially be the case for Point of Care (POC) devices, being regarded as an essential element of the intended transfer of medical diagnostic services to the smaller hospitals. The Chinese POC market is currently already above $8 B and expected to show a yearly growth above 20%. Checking for hereditary diseases (in relation to one child policy). Increasing number of elderly people. Increasing concern about air and water pollution. China recognized the potential of bio-chip technology as early as 1997. The bio-chip activities got a boost by the return of Chinese academics that studied or worked overseas. The returning academics also helped in cementing relations between Chinese and western universities. The number of patents filed by Chinese organisations is impressive, but there are two concerns: the quality of it and the likelihood of commercialization of these patents. This last concern might especially be valid for the universities, who are the main patent holders. Only slightly more than 1/3 of the patents is owned by companies. The number of patents owned by commercial parties is only slightly rising. 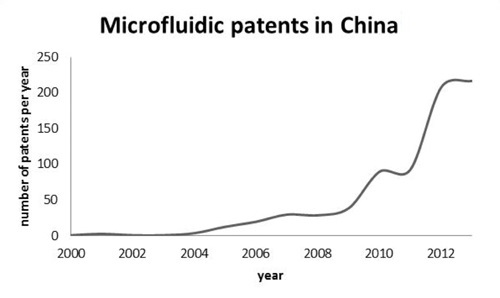 This dominance of the universities in patenting indicates an early stage of micro fluidic commercialisation. If we look at the orientation of the patents, we see a shift from technology orientation to application oriented, mainly in the medical domain. Notable is also the high number of patents in the area of (bio) chemical processing / microreactors. As a consequence of the developments in Chinese healthcare, the Chinese medical market is growing fast, and many Chinese universities are actively involved in this. As microfluidics is seen as an essential enabler of POC devices, hardly a university in China is not doing research in microfluidics. Hot topics in Chinese microfluidic R&D are: single cell analysis and high throughput screening, especially in relation to personal medicine. There are over 140 Chinese institutes and universities active in the area of MEMS / nanotechnology / microfluidics/ BioMEMS / biosensors. The large national level universities are well funded by the government and are often cooperating with big foreign or Chinese companies and foreign universities. The smaller universities are often working with smaller companies and are therefore generally more oriented to applied research. The most important Chinese research organisations are located in the east of China; Beijing for instance accounts for 16% of the Chinese R&D expenditure. Beijing tends to focus on academically oriented basic research; for instance 30% of all Chinese nanotechnology publications are produced by academics working in Beijing. The Shanghai region, on the other hand, is much more oriented towards applied research. To facilitate the industrial / commercial spin off from these academic activities, several local governments have created industrial parks, often located near the research centers. As most of the research centers are located in the east of China, it is also there where we find the majority of industrial centers; especially in Beijing and Shanghai, but also in Shenzhen. 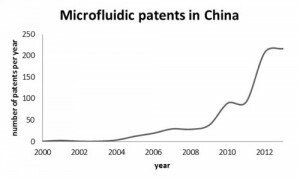 In a recent investigation, published by the Dutch organisation MinacNed 229 Chinese companies active in micro fluidics were identified. A very substantial part of them have their main activities in the area of medical diagnostics, followed in number by companies in the supply chain (foundries, service suppliers etc.). As elsewhere in the world, the Chinese industrial microfluidic activities cover a wide range of applications besides medical ones, such as: drug delivery, food safety, environmental control, microreactors, R&D instrumentation etc. Not only Chinese companies are gearing up to enter the Chinese market; quite a number of established western companies have representatives in China or started joint ventures with Chinese companies. The favorable conditions for high tech companies in China, especially for those in the bio / medical area, makes it certainly worthwhile to keep a track on them. Microfluidic technology plays a key role in the current academic developments in healthcare, food safety control and flow chemistry. The relative young microfluidic activities in China already cover the whole range of potential applications in healthcare from Point of Care to Organ on Chip. Especially in personal medicine interesting developments are to be expected. The combination of the availability of a large number of samples, a relative homogeneous population and a supportive government is providing a firm basis to China’s efforts towards personal medicine. But China is not only active in micro fluidics for healthcare, the microreactor research is also quite strong and instruments for non- medical testing are in development. In many areas China is doing world-class research work. 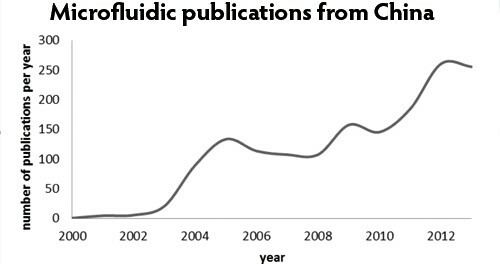 The industrial activities are (as yet) lagging behind, although that might change fast, due to active government support, entrepreneurial spirit, large internal market and a growing group of microfluidic experts, quite a number of them trained at US of European universities. With the increasing availability of VC capital, the Chinese double helix: strong alignment of government and industrial actions is slowly expanding into funding a triple helix where high tech start-ups will get access more easily. A weakness is the slowness and complexity of the Chinese bureaucratic healthcare system, slowing the entry of new products on the market. 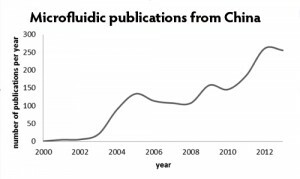 In conclusion it can be said that the Chinese market offers an opportunity as well as a threat for the existing microfluidic industry: a growing market in coming into existence, but the Chinese government will do its best to ensure that the Chinese industry becomes an important player in the field.